Every step in creating IsaDelight™ chocolates, from sourcing raw cocoa beans to producing the finished chocolate square, has been carefully considered to deliver outstanding quality and exceptional flavour. 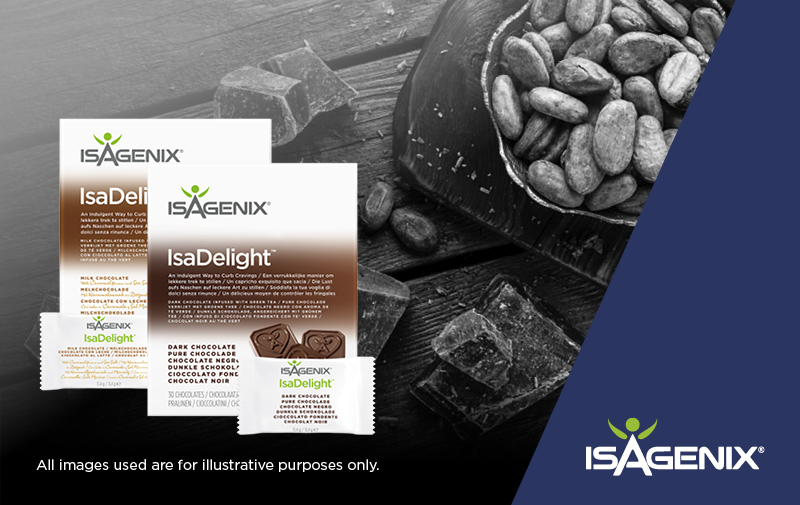 Isagenix sources only top-quality cocoa beans, which are hand-selected by certified cocoa graders. Our cocoa is grown on small, family farms and harvested at the peak of ripeness. Ensuring that the cocoa pods ripen fully on the plant before harvest allows the cocoa beans to achieve the highest concentration of natural compounds that contribute to the characteristic chocolate flavour. After harvest, cocoa beans are scooped from the cocoa pods and prepared using traditional methods. Our cocoa beans are gently processed using temperature-controlled methods to develop smooth texture and rich flavour while carefully protecting the cocoa’s delicate natural compounds. First, the inner part of the cocoa bean, called the cocoa nib, is roasted under a controlled temperature to release its deep chocolate flavour and aroma. Roasted cocoa nibs are finely ground to produce a thick liquid called cocoa liquor, but this liquid doesn’t contain any alcohol. Warmth generated during the grinding process causes the cocoa butter in the nib to melt, resulting in a liquid blend of melted cocoa butter and fine cocoa powder. During the final blending process, known as conching, the chocolate liquor is blended with additional cocoa butter, vanilla extract, and other ingredients to complete the IsaDelight recipe. Flavour ingredients are added to create the delicious flavours we have to enjoy. At this stage, a carefully formulated blend of nutrients is incorporated into the chocolate mixture. These ingredients include green tea extract, amino acids, and select vitamins and minerals to boost the natural benefits of chocolate. Each step in the process of creating IsaDelight chocolates involves precise temperature control to protect the delicate, natural compounds in cocoa, but temperature is most critical during tempering. At this stage, our chocolate mixture is melted at a mild 28 degree Celsius under carefully controlled conditions. Tempering helps to create a smooth, glossy appearance and a satisfying snap when you bite into an IsaDelight chocolate. When tempering is complete, the warm chocolate mixture travels through a short, insulated pipe and is poured into a mold, creating the familiar IsaDelight square. The molds are pre-warmed to match the temperature of the liquid chocolate and then quickly cooled to set the shape. The completed chocolate squares are released from the mold with a firm tap, then undergo a final quality inspection. Finished IsaDelight chocolates are immediately sealed in individual wrappers to protect freshness. IsaDelight chocolates are a rich, decadent-tasting treat that you can feel good about enjoying. Careful attention to quality at every step of the process from bean to square creates a delicious chocolate that is an indulgent way to satisfy cravings.